Najran Cement Company was established in 2005 as a Saudi shareholder company closed with a capital of one hundred and fifty million riyals. It obtained the first mining license according to the new mining system approved by the late King Abdullah bin Abdul Aziz to establish a project for the cement industry in the region. 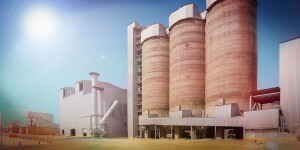 The project includes the main plant located in Al Mandafan affiliated to Sultanah Center; 240 km north east of Najran city as well as a separate unit for grinding cement which is located at the Aakfah center at about 70 km from Najran city on the road leading to the Asir area. The founding idea came across the mind after several studies and surveys to ascertain the presence of raw materials suitable for the cement industry. Based on the positive results obtained from the results of the analysis and description of the raw materials and the use of the information provided by the Ministry of Mineral wealth, the site was detected in Al-Mandan where it contains most of the necessary raw materials in the cement industry such as limestone, clay, sandstone and gypsum.